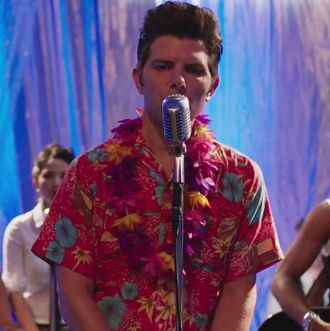 Midway through the Big Little Lies season finale, Ed Mackenzie, the awkward second husband to Reese Witherspoon’s Madeline, steps up to a mic, and unexpectedly, out comes a beautiful little rendition of Elvis’s “The Wonder of You.” Who knew that Adam Scott had it in him? you might think, but sadly, the show did not use Scott’s actual voice. The former Parks and Rec star explained on Conan earlier this year that he took singing lessons in order to prepare for his big song, but his voice didn’t make the cut. Who did you really hear sing at trivia night? On the Big Little Lies soundtrack, the cover of “The Wonder of You,” sung by Ed, is credited to Conor O’Brien, and “How’s the World Treating You,” sung by Nathan, is credited to Daniel Agee. Bonnie’s version of “Don’t,” however, was actually sung by Zoë Kravitz. In discussing the ten-day shoot for the party scene, Vallée told Collider, “The songs had to be ready. The actors had to record the songs, and then do the lip-syncing. And then, we had to shoot all of the different points of view.” So even though Kravitz did sing, she wasn’t singing live — what a big little lie!